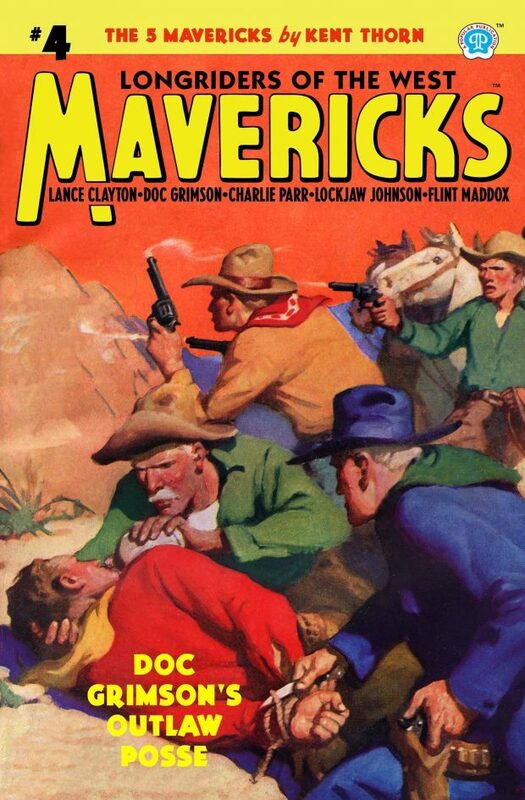 In stock on January 26 will be all five books in the classic Western series by Kent Thorn, The Mavericks. 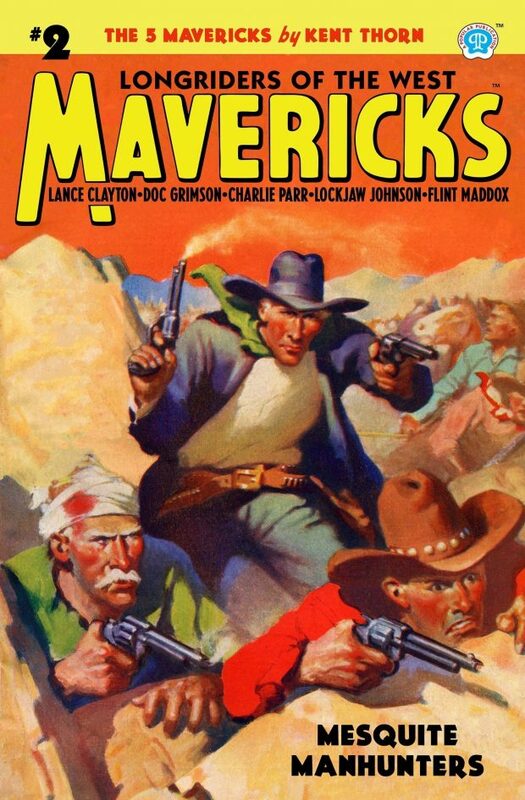 Originally published by Popular Publications, the Mavericks were a quintet of outlaws fighting for good in the old west. A throwback version of the same theme used in Popular’s Secret 6 series, this series has been out of print for some time. However, they’re available now in the digest-sized Popular Heroes series. Get them now! They were wanted men, those five hard-riding travelers of the still night trails…. 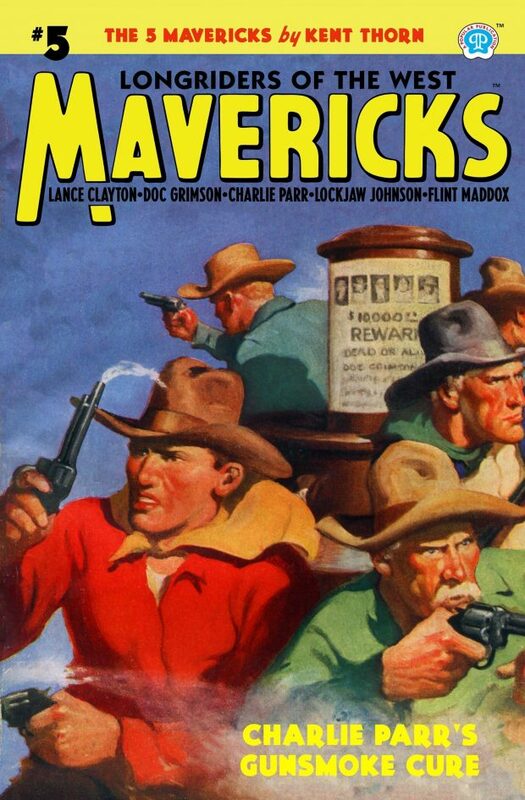 Mavericks all, they had entered outlawry for five different reasons, drawn irresistibly down the Owlhoot Trail from five different walks of rangeland life. They became one living inseparable unit of grim, uncompromising justice, united as one man by their friendship, their burning championship of the underdog—and the high, white flame of their courage…. 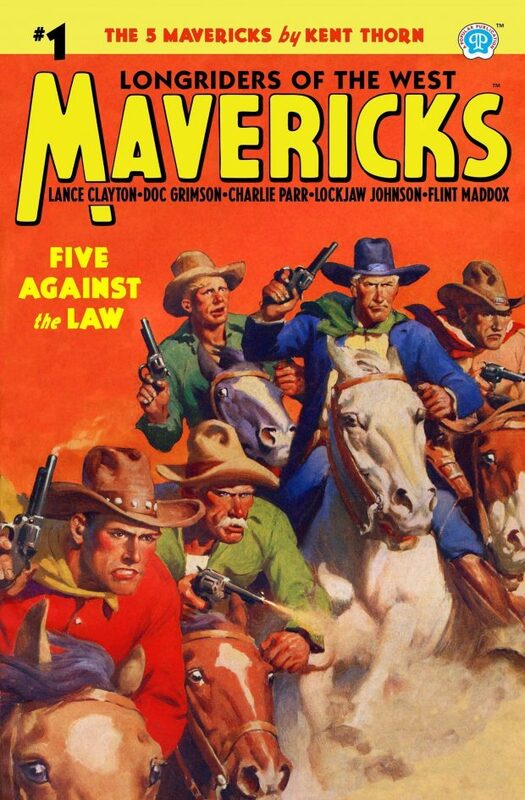 Step up folks and meet the five Mavericks—Lance Clayton, Doc Grimson, Charlie Parr, Lockjaw Johnson, and Flint Maddox…. You’ll ride with them through many a blood-tingling tale of high adventure and heady romance during the months to come. We know you’ll like your saddlemates! Men beyond the law, forever outcast from the security and happiness of normal life, were these five inseparable owlhooters. But they rode straight into a bristling hornet’s nest of posse guns to take up a blood debt for the law-abiding folk of Tarpaulin—who had disowned them! Another great novel of those unforgettable, recklessly courageous bravos—Doc Grimson, Lance Clayton, Charlie Parr, Flint Maddox, and the solemn-faced, deadly-shooting Lockjaw Johnson! 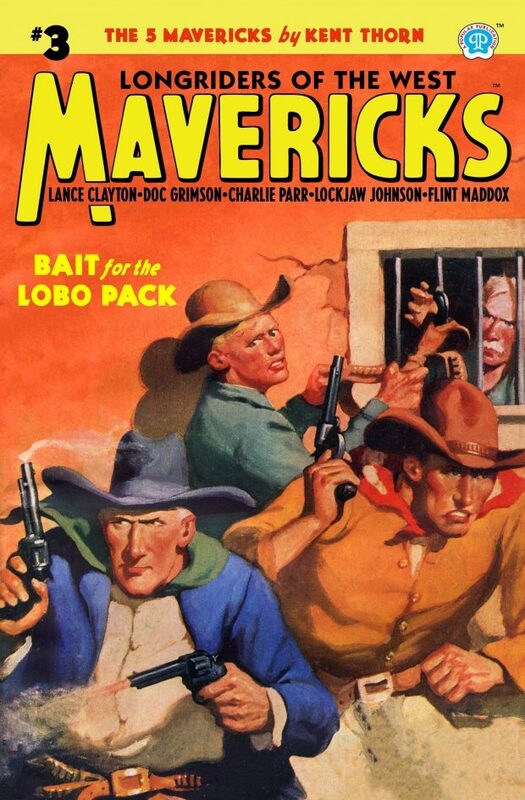 Five men, bound inseparably together by the immortal bonds of outlaw partnership, rode together below the Border to loot the rich booty of a thieving lobo pack. But the girl they found in that sand-town hell-hole drove them instead to a courage test in a flaming crucible of desert death and blasting killer guns. In hidden cabins and moonless rendezvous along the twisted Outlaw Trail, grim riders still whisper the names of the Five Mavericks; still tell, in the hushed midnight silence, of that time in Bear Creek County when Doc Grimson and his longrider bunch risked a sheriff’s noose and lobo lead to cleanse from their name the damning killer sign—braved the hungry guns of an entire county so that one victim of their supposed ruthless gunplay might realize her rightful heritage! Charlie Parr, white-haired member of the five inseparable, long-riding Mavericks, wanted to rob a bank and lay up an old-age cache of outlaw loot. The other four were willing to play along—until they ran blindly into a more exciting, more reckless, job, where they could chance their lives and gun-arm skill for a girl’s happiness—and a brave man’s lost courage!